Experience the grandeur and sophistication of Recoleta's architecture on this afternoon walking tour. Visit Palais de Glace, Pilar Basilica, and Evita Peron's mausoleum among many other fascinating sites at Recoleta Cemetery. Learn about the Spanish, British, Italian, and French influences in this iconic Buenos Aires neighborhood during a 2-mile (3.2-km) circuit led by an informative guide. Meet your guide in the afternoon and explore Recoleta on foot during this 2-mile walking tour. This easygoing tour steps off the beaten path and introduces you to the history, architecture, traditions, habits and unique features of Buenos Aires. Each of the sites has a story to tell and your guide will make sure you hear it! 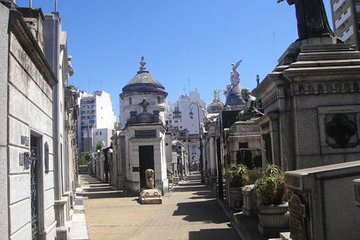 Visit Recoleta Cemetery and hear fascinating tales about Evita Peron, the misfortune of Rufina Cambaceres, Tiburcia Dominquez's miserly husband, and Admiral Brown. Stop by Pilar Basilica to admire its stunning architecture, then learn about the history of Recoleta Cemetery itself at the Recoleta Cultural Center and Old Monastery. View Bourdelle's Monument to Alvear, then continue to the Palais de Glace, where the Argentine tango came of age. Learn about the history of tango from your guide before visiting the BA Design Center and Terraces, the National Library, and the National Fine Arts Museum before your itinerary concludes. Children aged 8 years and under are free of charge when accompanied by an adult. Recoleta was a pleasant cultural shock... I was delighted to discover and bought a T-shirt from Hard Rock Cafe we chinese if we cannot avoid it, visit cemeteries only on that one day of all-souls day. It reminded me of the one I saw in Manila, that had street names!. we really enjoyed our time with our knowledgeable guide. the stories about each location were very good. VERY INFORMATIVE TOUR ! CHECK THIS ONE OUT ! The tour is supposed to last for 2,5 hours. The tour guide was a bit late and I had already gotten a bit worried. Then I encountered her. She told me that I'm the only person participating for the tour today, and because of that the tour wont take quite as long, as with a group it's more slow to move around. I thought that that's nice, a private tour, probably I will get even more out of it! - She didn't talk very much for a tour guide. Actually she talked VERY LITTLE. Half of the information I received was because I asked questions myself, for example some really basic info about the cemetary that I think she should have told me without asking! - The tour lasted less than 1 hour!!! I was quite astonished. I asked if she could maybe tell me something more as I was only in BA for 2 days and wanted to get as much out of my trip as possible. This is also the reason I booked this tour. She said Okay I can show you one more thing. Then she walked me to Evita's monument and the national library, that were 20 meters away afterwards I reviewed that this should have been included in the tour anyway, and now I got it as extra. After that she really seemed eager to get rid off me, so I left. We had started some minutes after 1 pm and finished before 2 pm. - introduces you to the architecture, traditions, habits and unique features of Buenos Aires. Each of the sites has a story to tell and your guide will make sure you hear it! Thank goodness there was Buenos Aires Free Tour that started at 15.30 highly recommend!!. I went there and I received more information in the first 15 minutes from that tour guide than from this tour guide during the whole tour. I have never met a tour guide as silent as in this tour, most of the time she was quiet. This was mostly waste of my precious time and waste of money. fantastic tour and guide. spent several hours walking around the charming neighborhood and cemetery. Guide was very knowledgeable. tour was well worth it. Very interesting this tour helped pull a lot of Argentine history together for us tour guide was helpful and had lots good information afternoon schedule is very hot in summer but we managed. I enjoyed a lot. The guide was very good and friendly. Soledad was a wonderful guide. Perfect English, and excellent knowledge of the history of the city and of the architecture we viewed. We even went to a local place for delicious empanadas after the tour -- someplace I would never have found on my own. Thanks for a great experience! The tour was great and great guide. Interesting, although I would have liked more information about more graves. You probably could do this on your own. The tour guide was very nice though and I enjoyed our conversations.